I absolutely love the Trim Healthy Mama way of eating. It has literally transformed my life. I look and feel better and just have more zest for life. 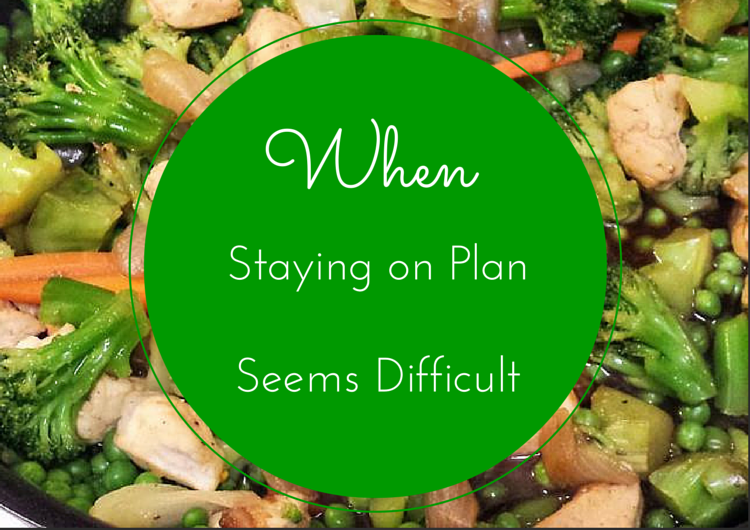 But staying on plan isn’t always the easiest, especially when life happens. Since I’ve started eating the THM way we’ve encountered a job loss, financial strain, illness, a death in the family and the stress of owning a business all the while raising and nurturing four precious kids. When life gets stressful (or let’s be honest, when I get lazy) I, unfortunately, want to abandon all the good habits I’ve established. Why oh why do I self-sabotage myself? Throughout my almost two-year THM journey, I’ve learned some tricks of the trade to help me refocus. My hope is that in this post you will find encouragement to get back and stay on plan. Trim Healthy Mama is truly a lifestyle. Of course, we all have those occasions where we might have a cheat meal, but don’t let one cheat derail you forever. Stop Beating Yourself Up ~ It’s so easy to get caught up in the vicious cycle of constantly reminding ourselves of all our bad choices. But you know what, that’s not going to do anyone any bit of good. Instead, make a clean break and move forward! Re-read the Book ~ The NEW version of the Trim Healthy Mama Plan book is incredibly helpful to read. The plan is broken down into very simple terms and is very easy to understand. I find that by re-reading the book occasionally (about 2 times a year) really helps me to remember why I wanted to start eating the THM way in the first place. It helps to keep me focused. Also, it’s a good reminder of the details of the plan. If you only have the older version I don’t usually re-read the entire book, but I find that chapters 6-14 in the original THM book beneficial to re-read as they really lay out the “meat” of the plan. Get Back to the Basics ~ There’s no need to make super fancy meals and desserts to be successful on the plan. The fancy meals and desserts are just added bonuses and add variety to the plan. You could eat the most simple meals from the book and still have just as good of success as someone who spends numerous hours in the kitchen. Especially for those of you who do not enjoy cooking, KEEP IT SIMPLE otherwise, you will burn out from food prep. Don’t Let a Lack of Finances Keep You Off Plan ~ This may be the biggest reason why people get off plan. I know I already said it in the last point, but you don’t need fancy meals and desserts to be successful on this plan. By eating simple proteins, fruits, vegetables, plan approved sweeteners, good healthy fats and plan approved grains and beans you will be successful. Often times you can find much of the food you need on sale, especially if you buy in-season produce and mark-down meat. Consider having meatless meals once or twice a week to keep the cost down. It is a myth that you have to have tons and tons of special ingredients. Here’s a sample meal plan that I did that contains NO special ingredients at all. Meal Plan, Meal Plan, Meal Plan ~ The old adage is true, “fail to plan, plan to fail.” For those of you that read my blog on any kind of regular basis know how important I think it is to have a meal plan, right down to what you’re snacking on and drinking. While some think it’s over the top, it really keeps me on track. I know exactly what I’m making for every meal and snack. I know what I need to pull out of the freezer ahead of time and it really leaves me little room to derail. This is why and how I meal plan. Each Monday evening I post a FREE meal plan and shopping list for the week. If this is an area of struggle for you, let me do the work for you! Again it’s FREE! Continue to Ask Questions ~ If you’re still a little confused or wondering if certain items are on plan, etc… don’t be afraid to ask questions. The Trim Healthy Mama board on Facebook is an incredible forum of Admins and other women who can help to clarify. If you’re on the newer side to THM the THM Beginners board of Facebook is also great. Just Get Going! ~ No matter how long you’ve been off plan start again today! Don’t wait for Monday to come around (you know you do it too), just jump right back in today! Your body will thank you for getting back to eating healthy, life-giving food. You are worth it and you can do it! This is wonderful information. It's pretty much my philosophy, as well! I always "keep it simple." I don't do hard. LOL If it were hard, I couldn't keep at it. As you said, I would burn out in a BIG hurry! I'm sharing this on my Facebook blogger page! Thanks! Thank you Darcy, that was so helpful. I am just starting and I did not know how. This will help me move forward into a healthy eating habit. Where do I find your free meal plan that you were talking about? Thanks again. Thank you for encouraging us to go to God first…..we sometimes do that last. He is the One Who knows what is best for us. Thank you for this web site, just found it today…. Hi Francis! I post them each Monday night. Also, right under the banner that says Darcie's Dishes, there are some tabs and one of them says meal plans. You can click on any of those and view them there. So glad you found me. And yes, it's just as much a reminder to myself to go to God first. He has all we need! Just found the sweet and spicy tea at my local wal-mart! oh my goodness! it is wonderful. Thanks Darci. This is great info. I'm getting really frustrated with losing the same 5 pounds over and over. It's crazy. And I think I'm doing great on plan, then I weigh myself and I'm either the same weight or up again. So thanks, this helps. Glad you like it! It's my cavorite tea ever! I just came to your blog by lookin for a THM pumpkin muffin. Your link was the top choice. I love your meal plan and am looking forward to following you. Thank you for being an inspiration. My calendar this year has a menu spot for each week, that's the reason I purchased it. I'm meal planning and ready to do it right. Finally, I've had the book since the beginning and do a week here for there, but finally feel God with me. I have been on plan for 2 years now but have failed miserably lately out of boredom and laziness. I slowly gained 10 lbs back and want so much to lose 20 more now all together. I originally lost 55 lbs. I want to jump in again and need to go back to the basics again. I don't ever want to go back to the way I was but I don't want to slowly give up and quit. Thank you for the encouragement!! Sooooo needed. Thank you Darcie! I needed this! I've been stressing out the last couple of weeks as my husband is going out of town for work for a month and I'm left to run the house and care for our three kids 8, 6, and 3. Money is very tight and I'm preparing for a busy homeschooling year too. Last night my cousin/bff talked me down from some non-THM cookie dough and suggested an on plan option. The accountability and support is such a must have. I need to do more of giving it to God though. He has control of things and I know I needn't worry but it's just too easy. Thanks again for sharing this post and your menu plans. I've used them more than once! ? Thanks for this! It give me an idea of the food list for THM and it sound very good. Wow, I absolutely loved this. I am going to print it out and put it right up there with my planning for 2019! Thank you so much for putting this together! Truly it is a blessing!